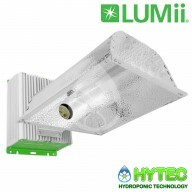 LUMII SOLAR 315W CDM The LUMii SOLAR 315 is a complete fixture that powers a 315s ceramic discharge metal-halide lamp (CDM) that will give your plants the best possible spectrum of light. 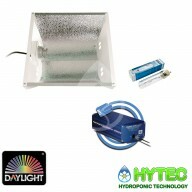 - Full fixture (ballast & lamp) - Short circuit protection - Use for both supplem..
MAXIBRIGHT DAYLIGHT LAMP AND BALLAST 315W WITH E40/PGZ18 KIT The new Daylight 315 digital ballast from Maxibright is compact, lightweight and silent running. 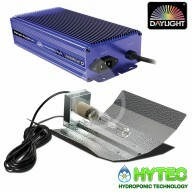 With all the features of the Maxibright Digilight range, this stunning ballast precisely drives Philips 315W Elite ceramic metal halide lam..
Maxibright Daylight 315w CMD Power Pack The new Daylight 315 Digital Ballast from Maxibright is compact, lightweight and silent. 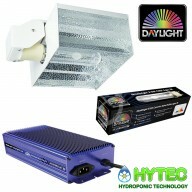 This stunning ballast has all the excellent features of the Maxibright DigiLight range but is precision designed to bring out the best of Philips’s unrivalled 315W elit..
Maxibright Daylight 315w CMH Power Pack The new Daylight 315 Digital Ballast from Maxibright is compact, lightweight and silent. 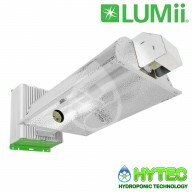 This stunning ballast has all the excellent features of the Maxibright DigiLight range but is precision designed to bring out the best of Philips’s unrivalled 315W elit..
LUMATEK DIMMABLE 315W CMH KIT Lumatek came up with this reliable digital ballast that has been successfully used in cultivation facilities around the world, it uses square-wave technology to efficiently fire and operate CMH lamps. 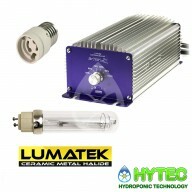 The Lumatek 315w CMH ballast when used with the 315W CM..
Maxibright Daylight 315W Ballast PHILIPS Lamp and E40/PGZ18 Kit The new Daylight 315 digital ballast from Maxibright is compact, lightweight and silent running. 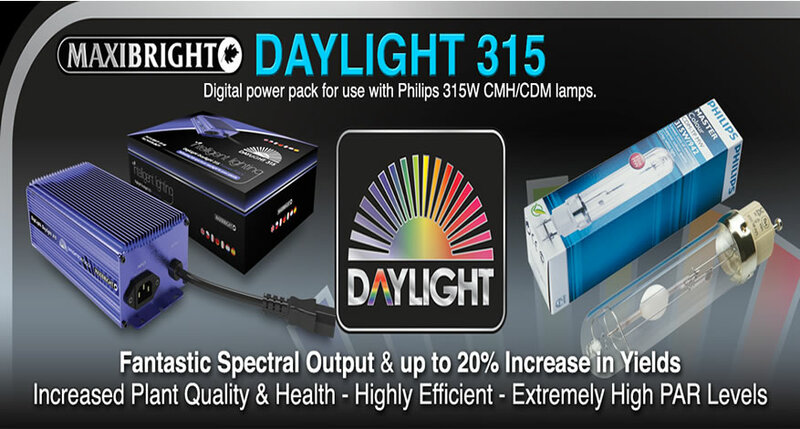 With all the features of the Maxibright Digilight range, this stunning ballast precisely drives Philips 315W Elite cerami..
315W PHILIPS CMD EURO KIT MAXIBRIGHT LIGHTING KIT The new Daylight 315 digital ballast from Maxibright is compact, lightweight and silent running. 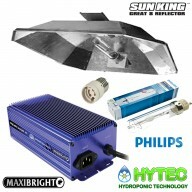 With all the features of the Maxibright Digilight range, this stunning ballast precisely drives Philips 315W Elite ceramic metal halide lamps; th..
LUMII SOLAR 315W CDM BALLAST KIT The LUMii SOLAR 315 W Ballast powers 315 W ceramic discharge metal-halide (CDM) lamps to give your plants the best possible spectrum of light. 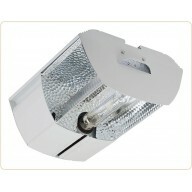 Suitable for all CDM 315 W lamps and ideal for use with LUMii SOLAR 315 W Reflector. 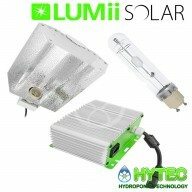 LUMII SOLAR 315W..
OMEGA 315W CDM DIMMABLE BALLAST THE OMEGA 315W CDM BALLAST RUNS A 315W CERAMIC DISCHARGE LAMP WHICH IS INCREDIBLY BRIGHT FOR SUCH A LOW POWER CONSUMING BALLAST! 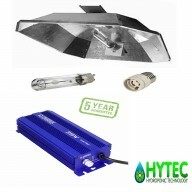 IT FEATURES 4 UNIQUE DIMMING SETTINGS – 150W, 250W, 315W AND 340W SUPER LUMENS SETTING. 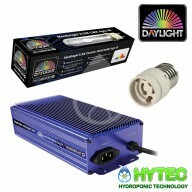 AS WITH ALL OMEGA DIGITAL BALLASTS IT COMES WITH..
MAXIBRIGHT DAYLIGHT BALLAST & BULB 315W FOCUS KIT The new Daylight 315 digital ballast from Maxibright is compact, lightweight and silent running. 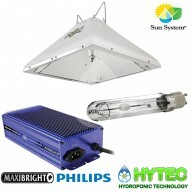 With all the features of the Maxibright Digilight range, this stunning ballast precisely drives Philips 315W Elite ceramic metal halide lamps; the..
MAXIBRIGHT DAYLIGHT BALLAST & BULB 315W HORIZON WIDE-ANGLE KIT The new Daylight 315 digital ballast from Maxibright is compact, lightweight and silent running. 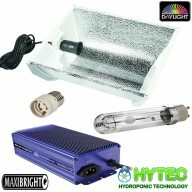 With all the features of the Maxibright Digilight range, this stunning ballast precisely drives Philips 315W Elite ceramic metal hali..
Maxibright Daylight 315W PHILIPS ADAPTER Kit Kit Comprises of 1 x Adapter 1 x Maxibright Daylight 315W Ballast 1 bulb of your choice ( Philips MASTERColour Daylight Elite Ceramic Agro MH EL 315W/930 Lamp) MAXIBRIGHT DAYLIGHT ILINK 315W CMD POWER PACK The Da..
Maxibright Daylight 315W Ballast Mini Supernova Kit The new Daylight 315 digital ballast from Maxibright is compact, lightweight and silent running. 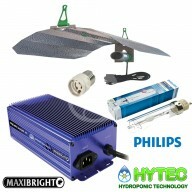 With all the features of the Maxibright Digilight range, this stunning ballast precisely drives Philips 315W Elite ceramic metal halide lamps;..
Maxibright Daylight 315W PHILIPS Euro Kit Kit Comprises of 1 x Adapter 1 x Maxibright ILink Daylight 315W Ballast 1 bulb of your choice ( Philips MASTERColour Daylight Elite Ceramic BLUE MH 315W/942 Lamp OR Philips MASTERColour AGRO RED MH 315W/930 Lamp) 1 x Euro Reflecto..
MAXIBRIGHT DAYLIGHT 315W BALLAST HORIZON KIT The new Daylight 315 digital ballast from Maxibright is compact, lightweight and silent running. 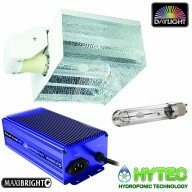 With all the features of the Maxibright Digilight range, this stunning ballast precisely drives Philips 315W Elite ceramic metal halide lamps; the Daylight..
315W CDM DAISY 60CM KIT PHILIPS MAXIBRIGHT LIGHTING KIT The new Daylight 315 digital ballast from Maxibright is compact, lightweight and silent running. 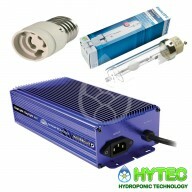 With all the features of the Maxibright Digilight range, this stunning ballast precisely drives Philips 315W Elite ceramic ..
SOLIDIGITAL 315W SUPERBRIGHT CDM DIGITAL BALLAST SUPERNOVA KIT The Sol-Digital Superbright 315w ballast is not like any ordinary ballast.The software controlled ballast has been specially designed to give the most selective growers the ultimate versatility and perfor..
Maxibright iLink 315W PHILIPS Single Daylight Reflector Kit Kit Includes: Maxibright ilink Daylight 315W Ballast Philips MASTERColour Ceramic MH EL 315W Lamp Maxibright Daylight 315w single reflector MAXIBRIGHT DAYLIGHT ILINK 315W CMD POWER PACK The Daylight iLink..
Maxibright iLink Daylight Supernova 315w kit with Philips Mastercolour Agro Red bulb lamp kit Kit comprises of Maxibright iLink Daylight 315W Ballast Supernova Reflector Philips MASTERColour Elite Agro Ceramic MH EL 315W/930 Lamp MAXIBRIGHT DAYLIGHT ILINK 315W CMD POW..
LUMII SOLAR 630W CDM TWIN The LUMii SOLAR 630 is a complete fixture that powers 2 x 315 ceramic discharge metal-halide lamp (CDM) that will give your plants the best possible spectrum of light. 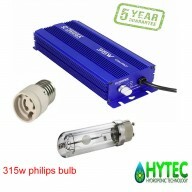 - Full fixture (ballast & lamp) - Short circuit protection - Use for both supplement..
315W PHILIPS CMD LEC GREAT 8 MAXIBRIGHT LIGHTING KIT The new Daylight 315 digital ballast from Maxibright is compact, lightweight and silent running. 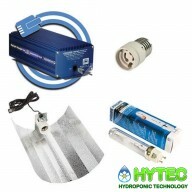 With all the features of the Maxibright Digilight range, this stunning ballast precisely drives Philips 315W Elite ceramic metal halide lamps;..
OMEGA CDM DIMMABLE BALLAST 315W AGRO DUAL SPECTRUM GREAT 8 LIGHTING KIT OMEGA 315W CDM DIMMABLE BALLAST THE OMEGA 315W CDM BALLAST RUNS A 315W CERAMIC DISCHARGE LAMP WHICH IS INCREDIBLY BRIGHT FOR SUCH A LOW POWER CONSUMING BALLAST! 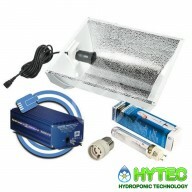 IT FEATURES 4 UNIQUE DIMMING SETTINGS – 150W, 250W, 315W AND ..
SUN SYSTEMS-LEC315W-MAXIBRIGHT BALLAST KIT Finally a perfect parbolic shade for the game changing 315w Maxibright ballast .The Sun System® LEC® 315 RA™ Remote Reflector utilises cutting edge Light Emitting Ceramic® technology. 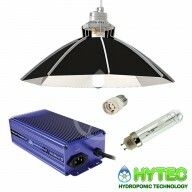 This fixture is a remote style reflector for better versatility ..
dPapillon 315W Professional grade full spectrum lighting system The answer to the full spectrum plasma lights which are more reliable, more efficient and more light per watt than PLASMA. 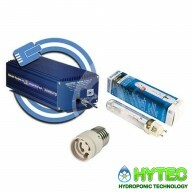 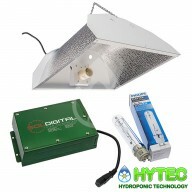 The GreenPower and Daylight grow lamps are full spectrum lamps that irradiate the farred and UV ..